We joined in the centennial celebrations for British composer Benjamin Britten﻿ by attending the concert of Peter Grimes at Carnegie Hall. 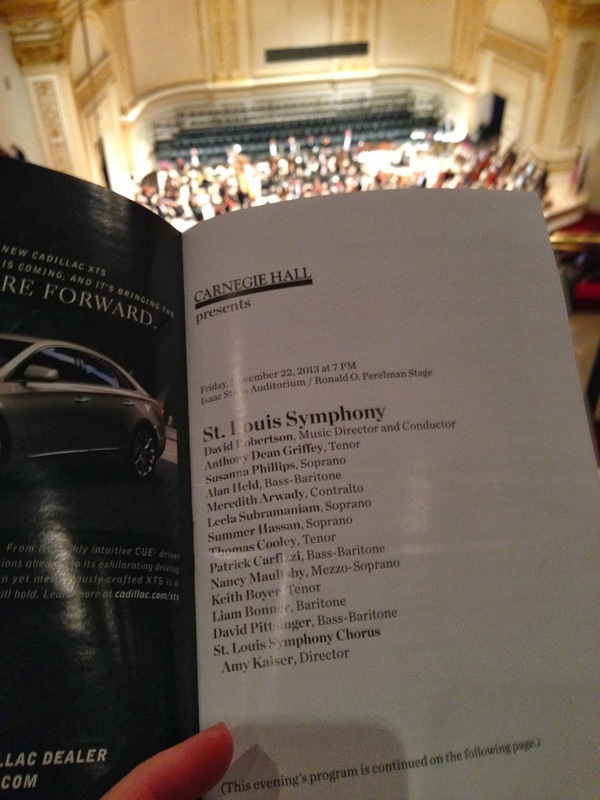 The stars were Anthony Dean Griffey in the title role, Susanna Phillips as Ellen Orford, the St. Louis Symphony under the direction of David Robertson, Alan Held as Captain Balstrode, Meredith Arwady as Auntie, Patrick Carfizzi as Swallow, Nancy Maultsby as Mrs. Sedley, David Pittsinger as Hobson, Thomas Cooley as Robert Boles, Liam Bonner as Ned Keene, Keith Boyer as Horace Adams, Leela Subramaniam and Summer Hassan as the Nieces and the St. Louis Symphony Chorus under the direction of Amy Kaiser. I had seen full productions of Peter Grimes both at the Met Opera and the WNO. I was thrilled to really hear this production, especially for Britten's rich orchestrations, particularly during the storm scenes. The entire concert was thrilling. Tony Griffey is magnificent as Peter the loner fisherman, while Susanna brought elegance to the empathetic teacher. Both Tony and Susanna are superb actors; even without costume and set, they brought a realism to the production. I loved the entire cast - they brought vocal and acting satisfaction to the production. Peter Grimes is the ultimate murder mystery opera. Even after experiencing this opera live three times, I still don't know if Peter did it or not. The story of the fisherman who is perhaps a victim of circumstances and the closed minds of his fellow villagers is heart wrenching. The emotion in this music is palpable and the St. Louis Orchestra showed its affinity for this masterpiece. And the viola! My God - I really didn't believe a viola was capable of making such a such. I can still feel it in my bones.